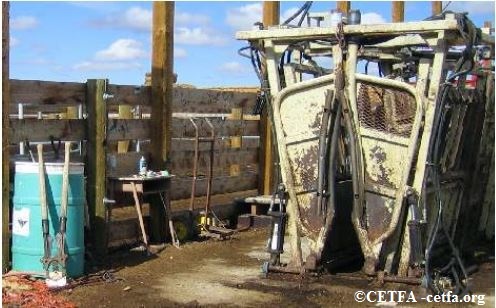 Cattle raised for beef in Canada are routinely castrated and dehorned without any anaesthetics or analgesics. 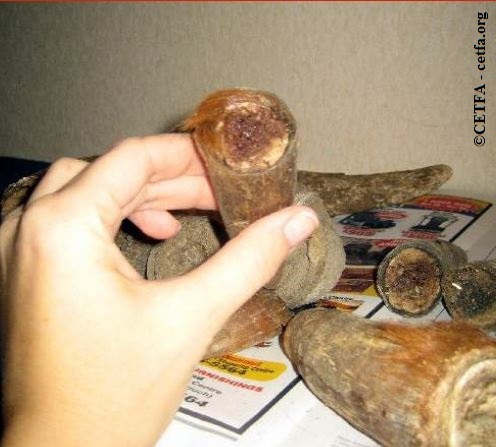 Cut horns showing innervated tissues. Young calves, called “bawling calves” are sent to auction the day they are forcibly removed from their mothers. They cry out for their mothers and frantically pace their pens. These calves lose 8% of their weight from the severe psychological trauma of weaning. It is because of this that the bawling calves are preferred by buyers. If they were to wait and let the calves go through the stressful process on-farm they would be too dehydrated and weak to withstand the stress of auction and difficult journey to the feedlot. According to American regulations, all beef cattle at Canadian auctions bought by American buyers must be branded. Branding is intensely painful and results in 3rd degree burns, yet no anesthetics or analgesics are provided. The young cattle who have not yet been dehorned have the painful procedure done at the auction with large cutters. The dehorning is done haphazardly with workers often cutting them too short, cutting through sensitive, living tissue. During transportation they may experience extreme ranges in temperature with one recent federal government study showing a 48°C temperature difference during the same trip. 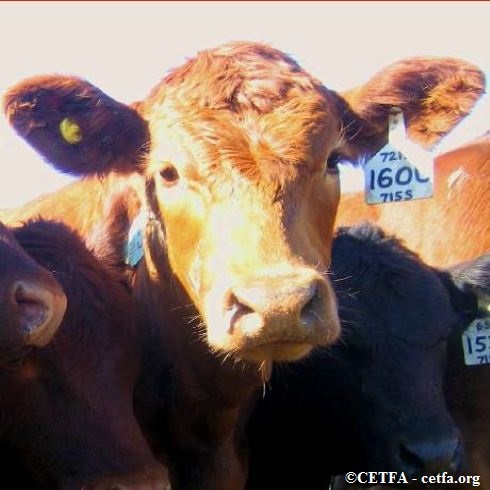 This same study found nearly 30% of cattle are transported in temperatures greater than 30°C. Cattle in Canada can also legally be transported a staggering 57 hours without feed, water or a rest. 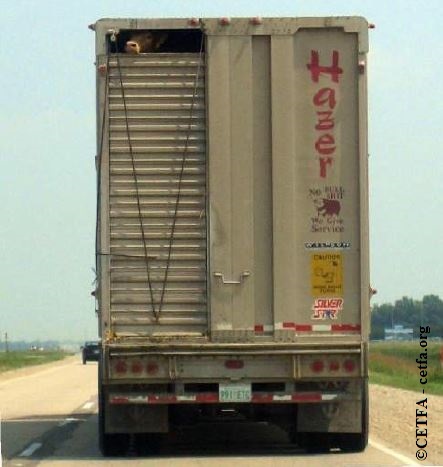 Beef cattle transported to slaughter. Life at the feedlot is often one of neverending filth. The dusty (if an outdoor feedlot) or sloppy (if indoor) conditions often lead to the development of eye conditions such as cancer eye, pink eye, and conjunctivitis; and they suffer skin conditions such as ringworm, lice, mange, and bacterial skin disease and infection from being forced to lie in the filth. Animal with serious eye condition. 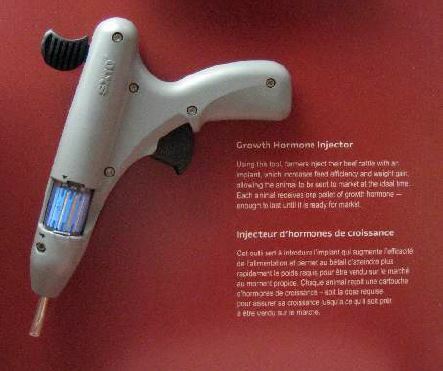 While cattle producers claim they do not feed hormones, they do implant them via capsules in the ears of cattle. Beef cattle are transported between three to seven times during their lives. Electric prods are routinely used to move them. A federal government study showed Canadian cattle are vastly overloaded during transport, causing injuries and increasing the risk of trailer accidents. 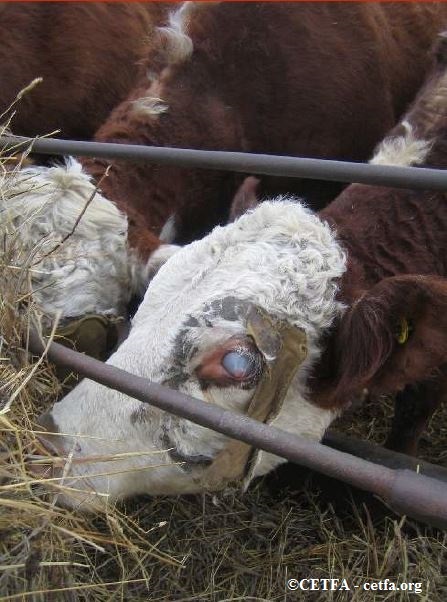 Upon arrival at the slaughterhouse, the cattle will be shot in the head with a captive bolt gun to stun them. As many as 5-10% will not be done so effectively enough to render unconscious, yet they will have their throats slashed and bleed out. Hopefully, the processing line will be slow enough to allow the cow time to die before it enters the hock cutting line, although some are not and literally die “piece by piece”, as one slaughterhouse worker told The Washington Post.